Why Re-Hab When You Can Pre-Hab? I am pretty chuffed with myself right now. Let me explain. When I was at uni studying Osteopathy at the time of the Sydney Olympics, I was taught by a fantastic lecturer who had a great party trick. Keri could watch participants in track and field events and pretty much tell you who was going to win just by looking at how they moved. Now at the time I thought this was WAY cool. Keri was quite blasé about it however. She pointed out that most track and field events require a narrow range of skills BUT these skills must be executed with absolute precision. How well someone moves, determines how likely they are to achieve this perfect technique. Didn’t mean that I could do it though. I would just scratch my head, as Keri would calmly predict who would appear in the top 3 places – across an alarmingly high number of events. Seriously she should have quit Osteopathy and just started punting! Makes sense right? How well you move determines how much speed and power you can generate which in turn determines the level of skill you can demonstrate in any athletic pursuit. Fast forward to the 2014 Glasgow Commonwealth Games. Last week the radio alarm woke me up at 6:30 like it does everyday with me expecting a news and weather update. However this particular morning the games were live on radio and I listened to the final of the womens 100m sprint. Afterwards the radio announcer said that the men were up in 8 minutes time. I sprang out of bed so fast that even the cat couldn’t jump clear in time. (Yes, yes I know I tell you not to do this). A new record for shower speed on a cold winter morning and firmly planted in front of the telly just as the camera was showing the close up of the runners. Damn!! I had missed them walking up to the blocks – the key thing I remembered that Keri used to look at. So I studied each person as the camera locked onto them. I also turned down the commentary, as I didn’t want to be distracted or biased. By the time they had finished filming each runner, I had made a few mental notes. But one thing was missing. I couldn’t compare them to each other. Then the camera panned back to take in the entire line up. It was like a veil being lifted. Suddenly I was seeing what Keri could see. It too was WAY cool. The patterns were very, very clear – his upper body muscles are too big for the lower body, he moves to his left side easier than his right, his weight stays over the right foot, that guy has his left shoulder rotated forward. When the camera panned back, it was really obvious to me that the giant 6’5” Jamaican and the tiny (by comparison) Brit were the two to watch. And guess what – they were 1st and 2nd. The Jamaican was the favourite as he ran the best times in qualifiers so even though I didn’t know that when the race started, I am not sure anyone will give me points for that pick. But the Brit? The announcers were amazed, they talked as if he should have considered himself lucky to even be in that line up let alone earn a silver medal. Clearly I can now see the same thing Keri does. At this exact moment “it was WAY cool” now translates as “I am WAY cool too”…. Or at least, truly a nerd who has notched up to a new level. Go back and read those observations again. And think about how that might affect someone who must run as fast as they can with perfect technique. How can you possibly run your fastest time if you have asymmetries and restrictions in your basic movement patterns? I don’t care how much you lift in the gym, or how much video analysis your coach has done concerning the 5 degree drop in the right arch of your foot. No perfect movements patterns, no gold (or silver, or bronze) for you. This is VERY different to a judo or MMA match that I am used to watching. It’s pretty much certain that both athletes will have small niggling injuries going into the match. So neither will be moving as well as they should. Part of the skill of the event is trying to move your opponent into a position where you can use your most effective techniques – precisely because we tend to be better at some techniques on the left and others on the right. What about tennis? Its completely asymmetrical as you hold a racquet on one side only. When they have movement restrictions – from tightness or injury – its really obvious to see. They will completely over-run one position just to put their body in an alternative more “comfortable” position to hit the ball more easily. We are totally amazing at compensating for movement problems elsewhere in the body. BUT it comes at a cost. Eventually the body runs out of options. And the result is stiffness at best but usually results in pain occurring somewhere down the track. Degeneration of the joints will almost always occur because an uneven load across a joint creates wear and tear over time. This means that we treat pain. Rarely do we have the opportunity to treat the underlying asymmetries and movement patterns that have set up the problems in the first place. And this is disappointing. Look at it from this point of view. We panic when a child doesn’t reach development milestones – say a child that still isn’t walking at 2 years old. But we FAIL to panic when a teenager can no longer squat! We should. 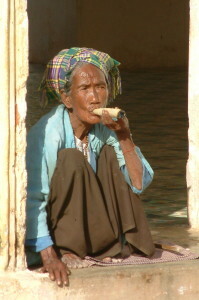 Worse still, we think it’s normal when someone over 50 can no longer squat bum to heels. Check out the difference between these ladies. None of which are 20 years old. Now tell me that losing this ability is normal as we age? Maybe you are thinking that the old girls on the left have knee problems that prevent them from squatting. True they might. But more often than not I can fully bend an unloaded knee. This indicates that the knee is in fact capable of full functional movement. Yet ask them to squat or hinge at the hips and I get all sorts of entertaining variations. Be warned – I will laugh. At you, not with you. Here is the thing. A lack of motor-stability control can cause just as many problems as mobility issues. And can just as readily lead to pain. The most obvious example of this is the person that gets treated and the same problem comes back again and again and again. Now this can be because we are not deigned to sit for long periods in cars or in front of computers – but we do by choice or necessity. Or it can also be because the body can’t take on the adaptive pattern that a treatment tries to help it find. Trying to get these points across to patients has always been difficult. Because I can tell you about it but you have no reference point for feeling it or any normative standard to compare yourself against. For a few years now I have been using my kettlebell fitness and conditioning classes to address these problems. On the whole, they have done a great job. More recently I have added a mobility class for those not able to or not interested in the demands of the kettlebell fitness classes. But a few people have still fallen through the cracks in my fitness classes – people who were aggravated by a couple of movement patterns and repeating the patterns caused pain rather than re-teaching the body how to move correctly. And this was under very small loads. Finally I have been introduced to a system that not only identifies when this will occur BEFORE it happens but also bridges the gap between mobility and motor control issues. In other words addressing the gap between Osteopathic treatment of mobility issues AND THEN re-integrating the treatment with the rest of the body as a whole. But in my opinion the major advantage is picking up underlying movement pattern problems BEFORE they become issues requiring Osteopathic (or worse still – orthopaedic) treatment associated with pain! I am sure you will agree that its WAY more useful to do some preventative pre-habilitation (pre-hab) work BEFORE an injury means you end up having to do re-habilitation (re-hab) instead!! You will hear this a lot more from me going forward. Ask yourself honestly – which would you prefer? Avoiding an injury in the first place? Or recovering from one? Avoiding injury just means regularly doing a few exercises to loosen things up and improve your motor control. Recovering from an injury is painful. This screening process is called the Functional Movement Screen (FMS). Its used internationally across a vast range countries and different types people – from professional Grid Iron and Basketball teams right down to regular folk like us who just want to move better and feel good. Not only have I learnt the actual screening itself, I have also taken their more advanced course to learn the correctives that get you back to good working order once more! Saskia is learning this too. I absolutely LOVE this system because it makes it clear and obvious to YOU exactly where your movement patterns are lacking AND provides a clear check-list on how to get them back again. This is the difference between me just telling you what to do and having you actually feeling it for yourself. The people I have already run through this screen have agreed that it make it incredibly obvious not only what is going wrong – but why. The aim of the screen is to find “0s” and “1s”. If you are in pain or can’t do it – there’s potential problems. Basically you need “2s” to be cleared as a lower injury risk for sporting activities. This is especially important for people in non-contact sports that still seem to get hurt. Runners, road cyclists and golfers seem to keep me busy despite the fact that there are no unexpected or sudden movements. The best time to have this screen done is when you are NOT in acute pain. Because pain changes movement patterns. Our bodies will simply not demonstrate normal movement patterns if it hurts. Instead we try to find a compensatory movement pattern that avoids this pain. That’s no surprise but what isn’t always obvious is that the compensation often remains when the painful stimulus has gone away. You read that correctly – in many, many cases, the body does NOT return to a normal movement pattern after the injury has healed. AND you won’t even be aware of it because this has become the new “normal” for you. Put your movements up against baseline movement standards (tested on thousands and thousands of other people) and it becomes very obvious where you fall short. Herein lies the biggest stumbling block to the success of the FMS approach. It’s a pro-active system NOT a re-active system. It’s for use when your symptoms are generally under control NOT when you are in acute pain where your usual movement patterns are compromised. Guys I have to tell you that this is the biggest jump I have seen in my 15 years of practice. It’s a way of showing you where your movement patterns don’t work AND giving you a road map to correct them. We are the ONLY clinic in the Southern Highlands performing the FMS system – no other musculo-skeletal therapists, no other personal trainers and no other sports coaches screen and correct using this FMS system. (In fact as far as I can tell, the only clinic between Sydney and Melbourne). So who should get themselves screened? Ideally – anyone who moves. Young or old. A tiny investment of time on prehab today trumps time and pain spent on future rehab every single time…..
(I have stolen this saying but I promised Duncan I would quote my source). Remember earlier in the article when I said “how well you move determines how much speed and power you can generate which in turn determines the level of skill you can demonstrate in any athletic pursuit”? 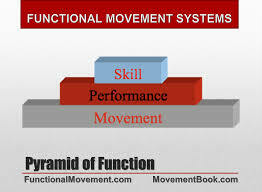 This “performance pyramid” shows that quality movement should be built first, then general athletic conditioning and only then, sports specific skills. We should never try to add more athletic conditioning without having a solid foundation of functional movement. That’s an accident waiting to happen. If anyone tells you to squat through your pain under load – then they are a total idiot and should be avoided at all costs! As they are teaching you to compensate rather than use optimal movement patterns. Lower the load, find non painful movements to achieve a similar goal – this is all fine. (Please note there are exceptions to this rule such as when undertaking a specific rehab program such as recovering from a knee replacement). Conversely many musculo-skeletal therapists make the opposite mistake…. They tend to be good at sorting out mobility problems OR stability motor-control problems but usually not both. And BOTH are vital to get you moving well and to the point where you can ADD general athletic skills. Next time we will delve into this “performance pyramid” concept for the more athletically motivated amoungst us. Where it gets WAY more interesting. But you have to walk before you can run…..
“Captain Kale” Yet Another Superfood? Mud Runs and Celebrity Diets – Motivating or Fads?